We didn’t have a name yet, but our first concert as a quartet was during the Slide Factory festival in Rotterdam in 2009. 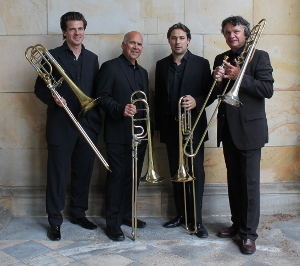 The festival’s theme being „Meet the World“, the organization named us the World Trombone Quartet, symbolizing our different styles and backgrounds and our roots in different parts of the (music) world. We all enjoyed it so much to make music together that we kept finding reasons to meet and to play together. From these encounters came the idea for this CD. We enjoyed to listen to each other, to learn from each other and brought all inspiration from our different backgrounds togehter: Just for Fun.